"‘The Drive’ was a great way for us to engage fans and deliver the benefits of Mobil 1 Annual Protection motor oil in a fun and unique way." NEW YORK--(BUSINESS WIRE)--On Wednesday, August 16 at Plaza33 outside New York’s Penn Station, ExxonMobil brought the worlds of NASCAR® and the NBA® together with a fan-friendly event called “Mobil 1 Annual Protection: The Drive” to support the company’s latest synthetic motor oil offering. Mobil 1 Annual Protection is a groundbreaking synthetic motor oil from ExxonMobil that was launched in March 2017 and offers consumers the convenience of driving one full year – or up to 20,000 miles, whichever comes first – between oil changes. Basketball and motorsports fans joined Stewart-Haas Racing’s Kevin Harvick and Basketball Hall of Famer Dikembe Mutombo at a pop-up basketball court where they were given the opportunity to put their shooting skills to the test in a series of challenges to win Mobil 1 Annual Protection prizes and rewards. 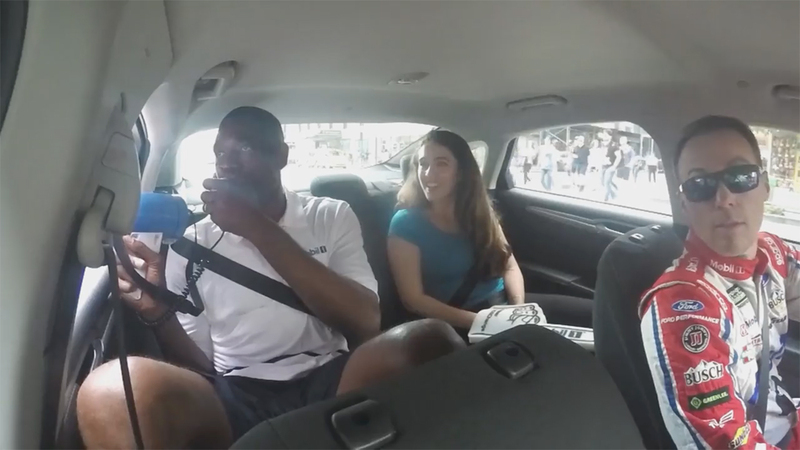 One lucky fan was given the once-in-a-lifetime opportunity to ride with 2014 Monster Energy NASCAR Cup Series champion Harvick in a Mobil 1 Annual Protection car, with Mutombo joining as a fellow passenger. 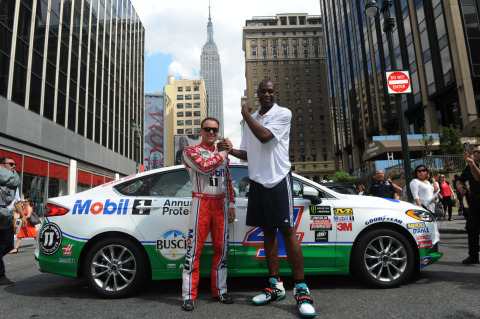 “The Drive” is not the first time Mutombo and Harvick have teamed up this year, with both appearing in the Mobil 1 Annual Protection motor oil nationwide advertising campaign as miniature-sized roommates living in an engine. Mutombo also got his first taste of NASCAR at the Kobalt 500 NASCAR Cup Series race at Las Vegas Motor Speedway in March, where he joined Harvick and the No. 4 Stewart-Haas Racing team on pit road. 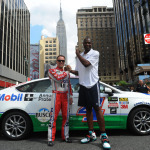 Fans can see footage from Mutombo and Harvick’s drive around Manhattan on Twitter @Mobil1, YouTube www.youtube.com/user/OfficialMobil1, Instagram www.instagram.com/mobil1 and on Facebook www.facebook.com/mobil1. On the track, the Mobil 1 Annual Protection brand served as the primary sponsor for one race for each of the four SHR entries during the 2017 Monster Energy NASCAR Cup Series season, including Harvick’s No. 4 Ford. The Mobil 1 brand has been the Official Motor Oil of NASCAR since 2003. The brand has been the Official Motor Oil of the NBA since October 2016.